Here in the Buckeye State, we get some extreme weather during the winters and summers and you need great heating and air conditioning systems in order to stay comfortable. If you need any kind of heating or air conditioning service in Gahanna, OH just call Quality Air Heating and Air Conditioning. We know that there are a lot of different contractors out there, but we here at Quality Air Heating and Air Conditioning run our business differently. We consider our customers our bosses because without you, we don’t have a business. That’s why we treat each and every one of our loyal customers with the care and respect that they deserve. We always work hard to provide you with the best possible service and your satisfaction is always our main concern. We offer comprehensive heating and air conditioning service in Gahanna, OH for many different types of systems. From repair and installations to maintenance and replacement, our expert technicians can handle any job that you have for them so call us today. If you’ve lived through an Ohio winter, then you know how much you rely on your heater to keep you nice and toasty. Quality Air Heating and Air Conditioning provides complete heating service in Gahanna, OH for many kind of systems including furnaces, heat pumps, ductless mini split heaters, geothermal systems and more. Whether you need repair in the middle of the night or you’re ready to have a new heater installed, just give us a call and one of our Gahanna, OH heating service experts can talk with you about your needs. If your heating system breaks down during the winter it can be a big deal. That’s why we here at Quality Air Heating and Air Conditioning offer 24/7 heating repair in Gahanna, OH. Whether your heater breaks down in the middle of the night or the day, you’ll always get a live person to pick up your call when you contact Quality Air Heating and Air Conditioning. Our expert technicians show up quickly and they specialize in finding the problem fast and getting your system back up and working again. Call us today for any repair that you need. For new heating installation, one of the most important things to get right is the size of your heating system. No matter how high quality the installation is, if your heater is the wrong size, your new heater could operate improperly. Quality Air Heating and Air Conditioning offers great heating installation in Gahanna, OH, and our technicians work with you from start to finish. We’ll help you find a great new heater that fits your home’s size and also your budget. Our heating installation experts are standing by ready to take your call. Having a good AC in your home is crucial during the summer. Everyone enjoys the warm weather that we get but we also like to spend time relaxing in the cool comfort of our home. If you need any air conditioning service in Gahanna, OH, Quality Air Heating and Air Conditioning is here for you. We can work on all types of air conditioners and we’re available 24/7 for emergency air conditioning repair. For new installation work, we can help from the beginning stages to ensure that you pick out the right size of system for your home. Call us today for any air conditioning service that you need. If your air conditioning system starts to give you any problems, Quality Air Heating and Air Conditioning offers total air conditioning repair in Gahanna, OH. From water leaks and new noises to icing, electrical problems and refrigerant leaks, our experts will find the problem quickly and then get your system operational as soon as possible. We know that your air conditioning system can sometimes break down after hours but it doesn’t matter: we’re available 24/7 for Gahanna, OH air conditioning repair service, so call us anytime. If the time has come for a new air conditioning system, don’t make the mistake of rushing out and finding the biggest AC that you can afford. That will likely only cause your home to become less efficient and less comfortable. Quality Air Heating and Air Conditioning offers complete air conditioning installation and we’ll help you from the start to the finish. Our technicians can consult with you to figure out exactly which size AC you need and recommend one that fits in your budget. Call us today to find out more. Just like maintaining your car is critical to its longevity, the same is true for your air conditioning system. Quality Air Heating and Air Conditioning offers complete air conditioning maintenance in Gahanna, OH for all types of systems. In addition to regular visits from our experts, you’ll also get reduced pricing, extended warranties and much more. Getting regular AC maintenance could reduce the need for repair, increase the efficiency of your air conditioner and also keep it running for longer. If you need to replace your air conditioning system, call Quality Air Heating and Air Conditioning. We know how complicated the air conditioning market is and our technicians can help you find a new system that fits your budget and your home’s cooling needs. We offer exceptional air conditioning replacement in Gahanna, OH so give us a call today if your air conditioner is old or if it has failed permanently. Are you starting a new business and need an HVAC system installed? Is your existing heating or air conditioning system causing you problems? The company to call is Quality Air Heating and Air Conditioning for all your commercial HVAC service in Gahanna, OH. We have worked with all types of businesses and we can handle any job that you need. From installation of rooftop or package systems, just give us a call 24/7 for all your commercial HVAC services in Gahanna, OH. Having your business’ HVAC system break down on you can cause big problems. 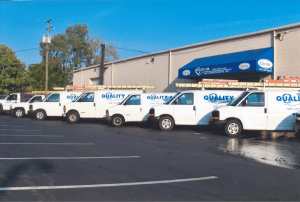 Quality Air Heating and Air Conditioning provides 24/7 emergency commercial HVAC repair in Gahanna, OH so call us whether your system breaks down in the morning or in the middle of the night. We can work on all types of commercial HVAC equipment including large components like chillers and cooling towers. We respond quickly to your call and our technicians have years of training and experience to deliver the high quality service that you deserve. Don’t let anyone but a trained expert install your new HVAC equipment. Quality Air Heating and Air Conditioning provides commercial HVAC installation in Gahanna, OH and our specialists have all the training and experience to be able to get your system installed quickly and then ensure that it is operating effectively and safely. Poor installation is one of the main causes of HVAC problems so call us whenever you need to have a new system installed. For the efficiency and life of your HVAC system, there’s nothing better than regular maintenance and tune-ups. Here at Quality Air Heating and Air Conditioning, we pride ourselves in offering only high quality services. Our commercial HVAC maintenance services in Gahanna, OH are outstanding and our maintenance program includes terrific benefits for our members including reduced pricing and extended warranties. Homeowners value heat pumps because of their ability to provide both heating and cooling in one convenient system. Also, heat pumps are some of the most efficient heating and cooling systems on the market. Quality Air Heating and Air Conditioning offers complete heat pump service in Gahanna, OH for all makes and models. Whether you need repairs for your current heat pump or if you’re interested in replacing your current HVAC system with a heat pump, just give us a call and we can handle any job that you have. If you need a new furnace in your home or if you’re looking for someone to fix your current furnace, call Quality Air Heating and Air Conditioning. We offer total furnace services in Gahanna, OH for all types of systems including gas, electric, and propane. If your furnace is blowing cool air or if it is making an unusual noise don’t hesitate to give us a call. Some furnace problems can cause huge risks to your health, so call us immediately when you discover any problems.